LotusOpening News |: What kind of world do you want? PHILADELPHIA, PA -- The National Park Service (NPS) has issued a First Amendment permit for a National Equality Rally at Independence Hall on Sunday afternoon, May 3, 2009 at Independence National Historical Park. Regional, state and national organizations, people of color, progressive religious institutions, high school and college GSAs, and straight ally organizations will be represented as Co-Organizers. Over 100 organizations from across the nation will March for Equality on Independence Mall. Leaders will carry their organization's name on pole-mounted placards. Activists, participants and straight allies will be offered American and rainbow flags. After completion of the March for Equality, activists, organizations, and allies will fill in Independence Mall for a one-hour high-impact Rally. Gay Pioneers Frank Kameny and Lilli Vincenz will lead grassroots activists, organizations, and straight allies in the March for Equality on Independence Mall from the National Constitution Center to Independence Hall. The Rainbow Chorale of Delaware will open the Rally with a choral tribute, and 100 members of the Philadelphia Gay Men's Chorus, Anna Crusis Women's Choir and the Mendelssohn Club of Philadelphia will sing a special rendition of "America the Beautiful" to end the Rally. The Philadelphia Freedom Band and members of the national Lesbian and Gay Band Association will join the March for Equality on Independence Mall. The Lesbian and Gay Band Association marched in President Obama's Inaugural Parade. There will be participants from the New York Big Apple Corps, D.C.'s Different Drummers, North Carolina Pride Band, and Flamingo Freedom Band of South Florida, among others, marching past the Liberty Bell Center and the Gay Pioneers Historic Marker to Independence Hall. Independence Hall and the Liberty Bell are where the Gay Pioneers held the first organized gay and lesbian civil rights demonstrations called "Annual Reminders" each Fourth of July from 1965 to 1969. The Annual Reminders laid the groundwork for the Stonewall Riots in 1969 and the first New York Pride Parade in 1970. "Independence Hall and the Liberty Bell are where the movement was launched. With a new Congress and a President who describes himself as a 'fierce advocate' of our civil rights, it is the right moment for us to join hands at an iconic location to demand Equality," stated Malcolm Lazin, Executive Director of Equality Forum. Equality Forum is a national and international GLBT civil rights organization with an educational focus. 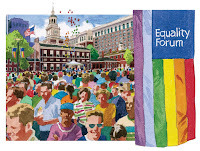 The National Equality Rally at Independence Hall will be held on the concluding day of Equality Forum 2009 (April 27 to May 3), the largest and premiere annual national and international GLBT civil rights forum. For more information about the National Equality Rally at Independence Hall, visit www.nationalequalityrally.org. For more information on gay-friendly Philadelphia or to book a hotel stay, visit the Greater Philadelphia Tourism Marketing Corporation's website at www.gophila.com/gay.